One year ago, I began a new series of blog posts I called “Refo500” in honor of the 500th anniversary of Martin Luther’s reformation. 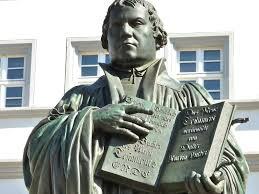 The goal was to publish one blog post a month reviewing one of Luther’s major texts from the new Fortress Press Annotated Luther series. I made it through about 6 of the planned 12 blogs. Things got a little difficult for me when I complicated my reading load by beginning a new series for 2018 where I intended to read a book a week (so far, also behind schedule but somewhere in the 30s). Between the two, it was probably too much. That being said, I loved reading through Luther and would like to extend the project a little. I’m not going to try and catch up with Luther; that is behind me now. But year two will be about Calvin. Mostly, I want to read a selection of Calvin’s Commentaries on Scripture. I think the goal will be to read his Harmony of the Gospels and Harmony of the Law. If there is time beyond that, perhaps his Commentary on Psalms.